There are over seven hundred known species of Alliums. The best known members of the Allium genus are onions, garlic, chives, leeks and shallots. The genus contains many species that are well suited for your flower gardens as well. 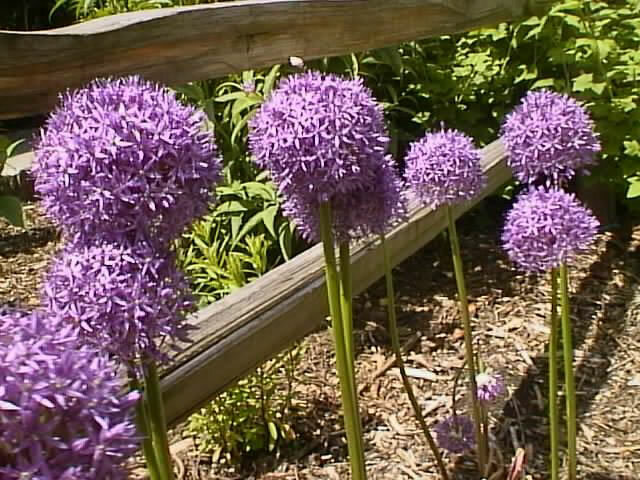 These Alliums are commonly known as Flowering Onions. Flowering Onions are bulb type plants with green, grass-like foliage. clusters, called umbrels, that can contain as many as 100 tiny, star shaped flowers. Flowering Onions should be grown in an open part of the garden that receives full sun for most of the day. They will tolerate a wide range of soil types as long as it is well draining, but fertile loam is best. Plant dormant bulbs in the fall, at a depth that is three times the diameter of the bulb. Allium aflatunense bulbs should be set 6" apart. Allium giganteum bulbs should be set one foot apart. Other species with small bulbs can be planted 3"-6" apart. Plant container grown clumps in the spring or fall, setting them at the same depth they were growing. The foliage of many species will die back immediately before or after flowering. Do not remove the foliage until it has yellowed completely! Persian Onions, Allium aflatunense, are hardy in USDA zones 4-8. Early summer bloomer with 4"-4½", round clustered umbrels of 50 , rose-purple flowers on 2-3 foot stems. 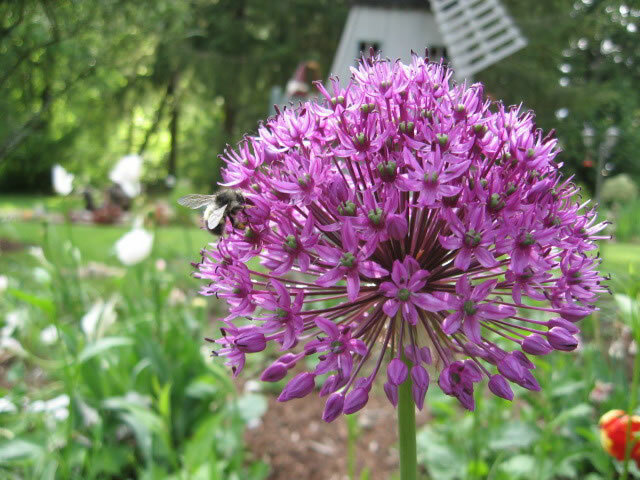 Giant Alliums, Allium giganteum, are hardy in USDA zones 6-10. Summer bloomer with 4"-6", dense, round umbrels with up to 100 star shaped, violet to deep purple flowers on 4-6 foot stalks. 'White Giant' hybrid bears white flowers. Coast Onions, Allium dichlamydeum, are California natives that are hardy in USDA zones 8-9. Summer bloomer with loose, upright umbrels with 10-15 bell shaped, magenta colored flowers on stout 10-"-12" stems. Allium senescens is a dwarf species that is hardy in USDA zones 5-9. Late summer bloomer with strap-like foliage that is evergreen to 25°. 1" domed shaped umbrels with 20-30 tiny, bright pink flowers on 6-"-12" mounding clumps. Three Cornered Leeks, Allium triquetrum, are immediatly recognizable by their triangular flower stems. They are hardy in USDA zones 7-10. Late spring to early summer bloomer with 10"-18" stems topped with small, loose umbrels of 5-15 nodding, bell shaped, lightly scented white flowers on quick spreading mounds. 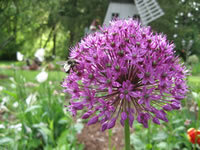 Alliums can be propagated by dividing the clumps of bulbs in spring or fall. Some species of Allium will produce small bulbils in their flower heads. Bulbils are small bulbs that can be planted like seeds. They will grow to a flowering size plant much sooner than seeds. Seeds should be sown while they are fresh and ripe. They can be sown directly in the garden in the summer or fall for germination during the following spring. To start your seeds indoors, place them in moistened growing medium and keep them in the refrigerator for four weeks, then sow them in trays or pots. Maintain a temperature in the growing medium of 65°-70°. Germination will take from 14-21 days. Alliums grown from seed will take three years to bloom.